Well, at least we finally know what Ben Carson has been up to since he became the Trump administration’s little-seen or-heard Housing and Urban Development secretary. And why not? 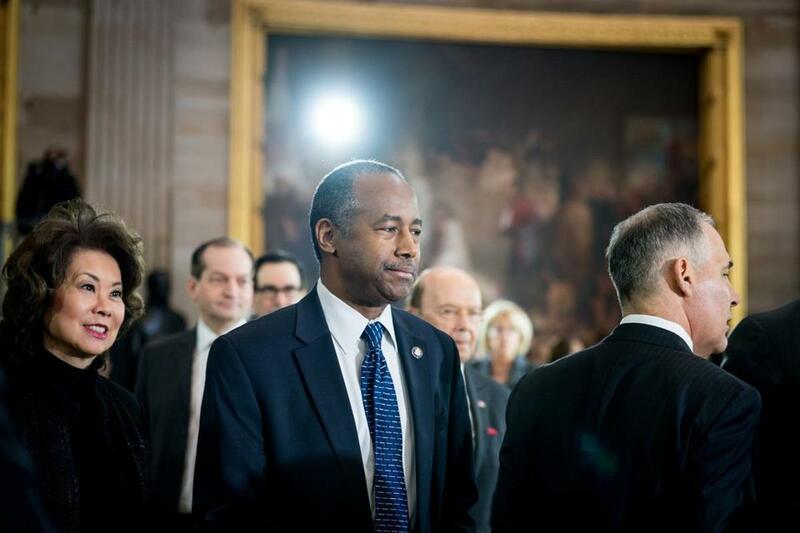 Most presidents would at least express public dismay if a Cabinet member spent $31,000 on an office dining room set, which is what Carson reportedly did. Yet no one expects to hear any presidential scolding. President Trump’s own financial excesses serve as tacit permission for his staff to turn us into his administration’s personal ATM — Always Taxpayers’ Money. The Globe’s Dan Wasserman takes a look at the Donald Trump White House. If Gowdy is going to investigate every stuff-loving Trump Cabinet member accused of excessive spending, he’ll have little time to do much else for the remainder of his time in Congress. In just a few weeks last June, Environmental Protection Agency Secretary Scott Pruitt and his staff spent more than $90,000 on first-class air travel. After claiming he did so for security reasons — people in coach, he claimed, were too mean to him — Pruitt recently said he’ll start flying coach. Last year, Price stepped down as Trump’s Health and Human Services secretary over mounting criticism of his extensive use of taxpayer-funded charter flights. One might have thought that controversy would chastened this administration, but Trump’s people were only getting started. Veterans Affairs Secretary David Shulkin is under fire after his chief of staff lied and falsified an email to mask expenses for Shulkin’s wife on a 10-day European trip. Documents released last year showed Interior Secretary Ryan Zinke’s use of government helicopters cost taxpayers more than $14,000. Another $3,100 was dropped on private planes for Zinke’s trip to the US Virgin Islands. Meanwhile, as his Cabinet lives large on taxpayers, Trump’s 2019 budget proposes a 14 percent cut for HUD; a 25 percent EPA reduction; and a 15 percent cut in the Interior Department. Don’t expect this to put a crimp in any cabinet member’s spending. Not to be outdone, Treasury Secretary Steven Mnuchin racked up $800,000 last year in a few months for trips on military aircraft, including one to get a good look at the solar eclipse. It hasn’t helped that Mnuchin is married to Louise Linton, who’s like Marie Antoinette with an Instagram account filled with photos of their taxpayer-funded adventures. Yet, nothing to see here, folks — the Inspector General claimed Mnuchin’s expenses were all fine and legal. 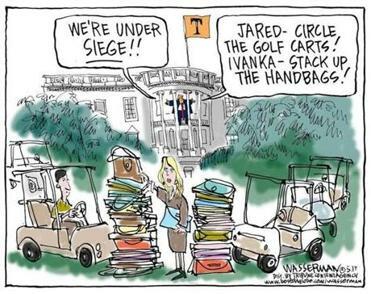 Often compared to a criminal enterprise, the Trump administration seems fixated on their taking as much as possible, for their own gain and comfort, from taxpayers. Of course, this starts with Trump himself. He was elected president but acts as if he was anointed a king, one who has no compunction about robbing the people he is supposed to serve. Last year, Trump’s many trips to Mar-a-Lago, his South Florida resort, costs $6.6 million in airfare alone. Certainly, there are marvelous perks to being president or a Cabinet member. Yet this administration abuses them to project a kind of imperial presidency, decked out all the gaudy trappings of wealth and stature. That’s what Trump has done his entire gold-bedecked life. Except now we’re the ones being used like a company credit card.